With the World Humanitarian Summit underway in Istanbul, GrandBazaarJewelers.com and the grassroots NGO Small Projects Istanbul have put Syrian refugees' stories front and center. A study by the United Nations estimates Turkey hosts 2.7 million refugees from its neighboring countries including Syria and Iraq. The proceeds from the World Humanitarian Summit tote project will provide 80 children with schooling for a year and will cover a month’s rent costs for the women of the craft collective. 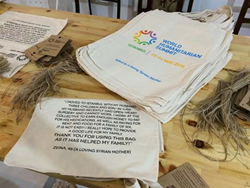 The 8,000 attendees to the first ever World Humanitarian Summit in history are receiving a personalized canvas tote with their conference materials. The story behind the tote highlights a diverse team of people with the goal of restoring dignity and hope to women and children affected by the ongoing war in Syria. Produced by the Istanbul-based NGO Small Projects Istanbul and GrandBazaarJewelers.com, the totes feature individual stories and signatures of the refugee women Small Projects Istanbul assists. The aim of the project is to reach all corners of the world, including influential policy makers. Winning a UN contract is no easy task, especially for a humble Turkish NGO operating out of a nondescript former textile workshop in one of Istanbul’s seemingly endless neighborhoods of bleak apartment blocks and little green space. Last October, the Armenian Master Jeweler owner of GrandBazaarJewelers.com, Nurhan Gumusmakas, and his wife Maureen were actively looking for a charity organization to support. Born in Istanbul, but raised outside of Detroit, Nurhan returned to Istanbul 6 years ago to build a wholesale Turkish jewelry design and manufacturing business in one of the world's premier jewelry markets, the famed Grand Bazaar. Living in Istanbul, it has become increasingly difficult not to witness increasing numbers of Syrian refugees begging on the streets. Most refugees are not given permission to work legally and educating their children in UN-approved Arabic curriculum is cost-prohibitive. “It’s terrible to see and the first thing I think of is my family. I know that survivors of the massacres and deportations 101 years ago in my family escaped to Istanbul with very little. I believe many people must have helped them to survive and begin thriving again here. The refugees of 2016 need help too. I’ve watched children here sharing a meal of rice on the ground in the center of the city. They aren’t even asking for money, they are asking for bread,” Nurhan pointed out. Nurhan is referring to the mass atrocities committed between 1915-1917 by Ottoman authorities on the indigenous Armenian population. He is one of only an estimated 60,000 Armenians who still live in what is today the Republic of Turkey. “To be here, where I walk past my grandfathers’ former shops, my great-grandfather’s church, and magnificent buildings created by my people - is inspiring. We [Armenians] are the best jewelers, renowned builders, and great artists. Knowing what we have suffered as a family, as a community actually drives me to preserve our legacy in these lands and assist others in need,” he continued. Nurhan began working on a simple, yet effective design - employing both Armenian Christian and Muslim Turkish artisans to make a product in 925 silver to benefit these new refugees. The letter "N", in Arabic writing, has been used by ISIS to announce where Christians live in the areas they have under control. Nurhan stresses the design is meant to symbolize ALL refugees that have been forced to flee their homes for safety. With years of knowledge and experience behind him, Nurhan optimized the design the discs and added symbolism to the piece with a finish which will oxidize differently for each person over time, as if the piece has tears streaming down. Nurhan and his wife Maureen began to have talks with Small Projects Istanbul. Founded by Karyn Thomas, the mission of Small Projects Istanbul is to provide access to supplemental education that will assist students and families from Syria to succeed in Turkey and beyond, paving the way for better opportunities in the future. In response to the expressed desire of the women that were frequenting their community center and participating in the Turkish and English language classes, the dynamic Co-Director Shannon Kay and Communications Manager Anna Tuson formed a craft co-operative for the women called The Olive Tree Craft Collective. Maureen and the team at Small Projects Istanbul taught the women how to weave the bracelets. In addition to these silver bracelets, the women began producing rings, earrings, canvas bags, and hats and scarves, many times with the assistance of Nurhan and his staff. Products made by the refugee women are sold through GrandBazaarJewelers.com and select retailers in the US, Australia, and Turkey. Most importantly, the refugee women began to regain a sense of normalcy back into their lives and form a tight community. The team at Small Projects Istanbul and Nurhan and his staff ambitiously decided to bid for a UN contract to produce 8,000 tote bags with only 3 weeks notice. The result? A beautiful bag with 8 touching stories of women in the craft collective and a tag personally signed by the some 70+ others that make up this small, but robust group. The proceeds from the World Humanitarian Summit tote bag project will provide 80 children with schooling for a year and will cover a month’s rent costs for the women of The Olive Tree Craft Collective at Small Projects Istanbul.